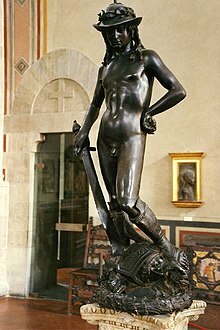 Donato di Niccolò di Betto Bardi (po Donatello) (1386 – 13 mis Kevardhu 1466) o artist Italek dres an Renaissance. Trigys o ev en Florens hag ev o pur geryes da drefen ev dhe vos onen a'n gwella gravyoryon en y dhedhyow. Ev a usys sort arbednek a dechnyk henwys 'hebasca bas', a wras y obereth apperya pur wir. Mab Niccolo di Betto Bardi o ev, hag ev a veu genys en Florens. Termyn Donatello a veu cottha, ev a studhyas gen Filippo Brunelleschi, an pednser. Ynwedh ev a weresas an gravyor Lorenzo Ghiberti dhe wul delowow rag an Battistero di San Giovanni. Rann a obereth moyha geryes da Donatello yw delowow a Mary Magdalene ha delow myns-gwir a David.